Depending on where you are working, each week you should have to fill in a Project Management Report or Weekly Highlight Report detailing progress on the project. 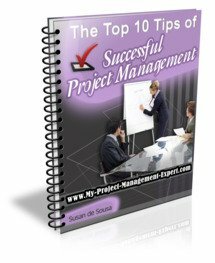 Now this project management report can be anything from a 1 page summary to a 12 page book. It really depends on how much the company you are at adheres to project management methodologies. Below you will find explained the sections a weekly project management report might contain which you will need to update each week. Wherever you work this one page is likely to be the bare minimum that you as a Project Manager will be expected to fill in each week as your project management report. As you see from the screenshot above, the key points are the RAG (Red, Amber, Green) status for the Risks, Issues, Next Milestone, Cost, Schedule and Overall. Please note that If any of these variables are in Red, then the Overall Status of the Project must also be in Red. This holds true if the Cost or Schedule are in Amber. In this instance the Overall Project Status must also be Amber. However if the Risks or Issues are in Amber then it is a judgment call as to whether you put the Overall project Status into Amber as well. It really depends on how critical either the Risks or the Issues raised are. You will note next to each status is a box which shows the trend. Essentially if you are in Amber but show the trend as Improving then this reassures the PMO that your Project could soon be in Green. In the right hand column in the Progress 1 Liner, you simply input the highlights the project has achieved that week. And in the Progress Detail below, you input more detail around which work streams have been doing what work, and the progress they have made. Essentially this report provides the Programme Manager and Project Management Office with a good overview of whether your project is in schedule, and the problems which are occurring. 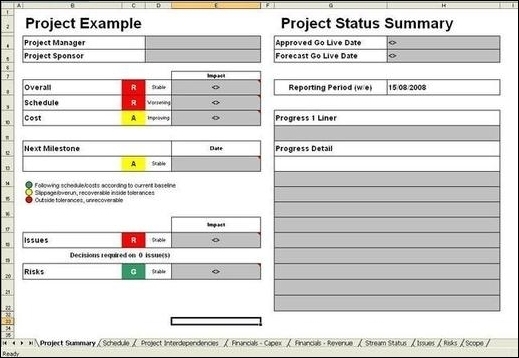 Be extremely careful how you fill in the Project Management Report RAG statuss. Particularly think carefully before putting any statuss into Red as this will immediately highlight the fact that your project has serious problems. In this instance ensure you have all the answers to any questions you will undoubtedly be asked, and also ensure that you can demonstrate the efforts you have made to circumvent the problems which have caused your project to move into Red. This similarly applies if you are in Amber. Finally there will always be times where putting your project into Amber or Red can be a good thing. This usually is the case when you want to highlight a potential problem. So for example that there is no contingency in the schedule or that you are totally reliant on one resource. However this tactic is usually one which is utilised the most be Test Project Managers as they without exception always end up with no resources and a ridiculous schedule to deliver to!